(NaturalNews) Voters in Portland, Oregon solidly defeated a city-wide water fluoridation measure yesterday, with 60% of the voters saying "NO!" to the practice of adding toxic fluoride chemicals to the water. The result is a huge victory for www.CleanWaterPortland.org and all the men, women and children of Portland who can now rest easier, knowing their tap water is not intentionally poisoned with cancer-causing chemicals derived from industrial waste and mislabeled "fluoride." The defeat of the measure absolutely infuriated fluoride-pushing doctors and dentists, many of whom resorted to using outrageous lies and dirty tricks during the entire campaign. These lies include whoppers like, "Drinking fluoride has never harmed anyone" and "this is naturally-occurring fluoride, therefore it's safe." Nowhere is there a more obscene departure from real science than in the "scientific" community of fluoride pushers. These people very well know that all sorts of "naturally-occurring" elements in the table of elements are extremely toxic to the human body. Mercury is toxic, yet it occurs naturally. Arsenic is highly toxic, yet it occurs naturally as well. I dare any of these fluoride pushers to chug a glass containing lead or cadmium. To claim that fluoride is healthful merely because it is found in water wells and the Earth's crust is an outrageously evil deception. Fluoride POISONS water wells around the world, and populations go to great lengths to try to remove it from their water! Fluoride pushers know this, but they seem to be determined to make sure as many people as possible are harmed through fluoridation, possibly as a way to make sure there's more medical business in the future due to toxic fluoride side effects. Most of the fluoride dumped into U.S. water supplies, by the way, is imported from China. And it just happens to be heavily contaminated with lead, arsenic, cadmium and other toxic metals. No city in the United States tests its fluoride for these contaminants and openly publicizes the results. It's all one big toxic secret, and the doctors and dentists who support fluoridation want to make sure it stays that way. Shhh! Science isn't allowed when we discuss fluoride! You're supposed to just buy into the "cult" of it, without asking any scientific questions. But even environmental groups understand this stuff is highly toxic. "...there is no safe exposure level for arsenic and lead," said Antonia Giedwoyn, a Sierra Club spokeswoman in Portland. "Why would we want to add any level of heavy metals to our water, that our kids and our parents and we ourselves drink?" (SOURCE). By the way, in my more than ten years of being an investigative reporter, activist and pioneer in online health news and information, I have never met a more arrogant, insidious and life-hating group of people than those who push for water fluoridation. Across the board, these people behave like psychopathic criminals who want to unleash death and destruction across every city in the world. They are very much like the "mad scientists" that Batman defeats in major motion pictures. They've abandoned any desire to listen to reason or logic, and they don't even recognize real science anymore. They remind me of Dr. Gosnell, the abortionist doctor in Philadelphia who would murder babies after they were born alive by severing their spinal columns with scissors. He called it "post-birth abortion" with the same level of evil arrogance that doctors in Portland used to call mass poisoning "water fluoridation." I am absolutely convinced that if you gave some of these fluoride-pushing doctors a couple of pairs of scissors, they would run around Portland stabbing infants in the neck if they thought they could get away with it. They might even call it something like, "Pre-emptive brain cancer prevention." 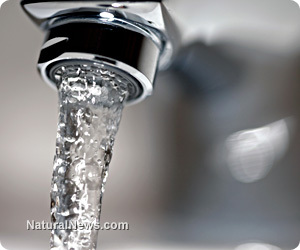 By the way, Natural News has already documented that much of the "fluoride" used in U.S. cities is actually an insecticide imported from China. Property: Colorless, transparent and smoky liquid with penetrating odor; highly acidic; soluble in water and volatile; with disinfecting action; corrosive to glass, ceramics, lead and other metals; highly corrosive to human skin and harmful to people's respiratory organs; keep it in a container made of plastics. ...used as anti-corrosion agent in wood, medical corrosion, fusing in welding... manufacture of rimmed steel, treatment of hides and skins for leather industry, adhesive preservative, purification and coloring flux in the melting of light metals. Oh yeah, and your idiot doctor wants you to drink it, too... right before he stabs you in the arm with a vaccine that also contains heavy metals.